A few weeks ago, I made a cake for N’s mom’s birthday. I had been waiting to make this cake for her for a while, since the flavors were right up her alley. Before I went to the market, I reviewed the recipe to see what ingredients I was missing. As my eyes scanned down the list, my heart skipped a beat. “1 cup buttermilk.” Crap. For those of you who bake a lot, you understand my pain. For those of you who don’t, I’ll break it down. Don’t get me wrong, buttermilk is delicious. It adds a creaminess and lightness to baked goods that I love. But here’s the problem: Buttermilk is only sold in two quantities. 1 quart and half a gallon. So, whenever you need only 1 cup of buttermilk, you’re forced to buy another three cups that you don’t need. This leads to throwing away curdled, long forgot buttermilk after a few weeks, or, like me, you begin to scour your cookbooks, Pinterest, and the internet for ways to use up your buttermilk. 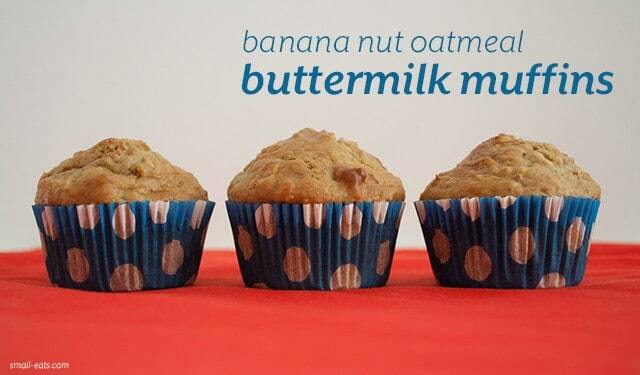 My go-to buttermilk recipe is banana bread, but I decided to go with some breakfast muffins I could grab on the way out the door to work. They’ve got oats in them too for some extra heft and longer satiety. Preheat oven to 400 F. Line muffin tin with paper muffin cups. In a bowl, soak oats in buttermilk for 15 to 30 minutes. Add in the eggs, sugar, oil, applesauce, vanilla and banana. In a separate bowl, combine flour, baking powder, baking soda and salt. Add dry mixture to wet and stir until combined. Fold in walnuts. With an ice cream scoop, fill muffin cups three-fourths full. Bake 18-20 minutes or until a toothpick comes out cleanly when inserted. Cool in pan 5 minutes before removing to a wire rack.